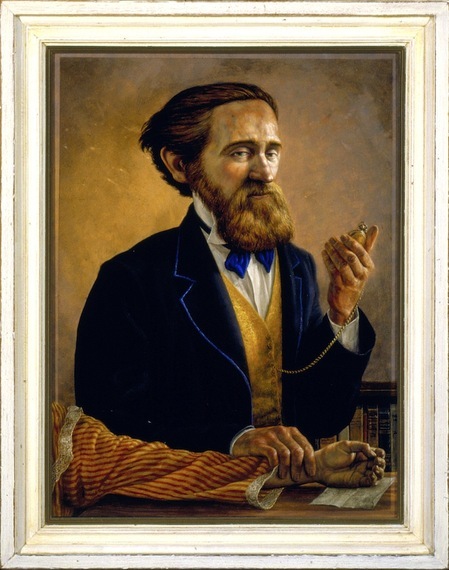 Calvin Lemuel Hoole, "Dr. Alfred Lane Patton", 1860, oil on panel, 24 x 18 inches. Shortly after moving from Mississippi to St. Louis in 1856, Dr. Alfred Lane Patton (1819-1886) commissioned Calvin Lemuel Hoole, a self-taught painter in Missouri, to paint the history of the Lane, Thomas, Hampton, and Patton families. 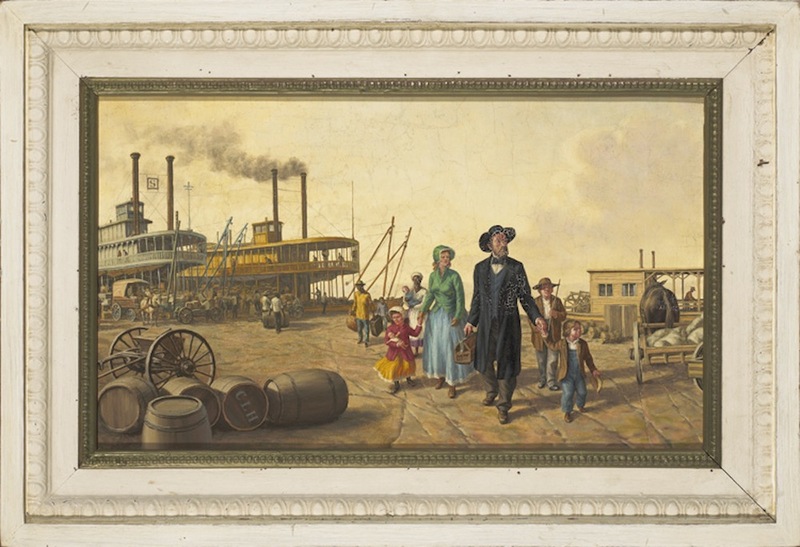 Over the next five years, Hoole painted at least a dozen works depicting what was then known of the family characters that had helped shape the American South. As an itinerant painter, Calvin Hoole's primary source of income was portrait painting, and many families in Missouri's backwater communities were lucky to have such an accomplished and affordable artist to record the appearance of loved ones. Hoole honed his skills with constant drawing from nature, and by paying careful attention to the nuances of human gesture in his sitters. Here the kindness and intellectual acumen of Dr. Patton is expressed in the subtle sparkle of his eyes and the delicacy of his features. Calvin Lemuel Hoole, "The Dr. Alfred Patton Family Arrives in Rocheport in 1857", 1859, oil on canvas, 11 x 19 inches. Leaving Raymond, Mississippi, for Rocheport, Missouri, in 1856, Dr. Patton hoped to take advantage of the Western boomtown's growing wealth, and thrived as its physician and as a civic leader. Calvin Hoole painted the southern family stepping bravely into their new life. 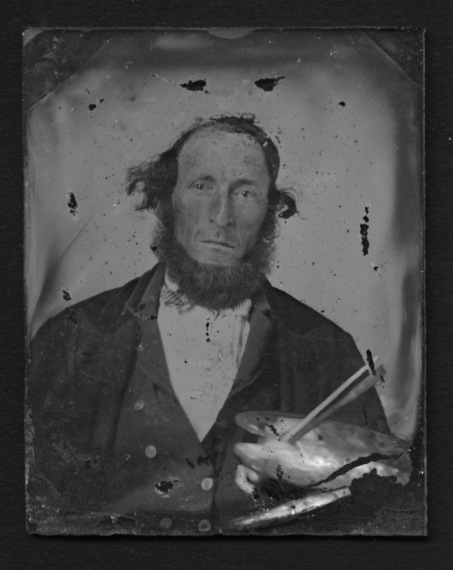 Calvin Lemuel Hoole, "The Foot-sore Painter" (1811-1863), was active in Missouri from 1833 until his death from wounds sustained at the Battle of Pea Ridge. A friend of Missouri painters Carl Wimar and George Caleb Bingham, Hoole emulated their styles but brought his own vision to bear upon his favorite subjects of frontier adventure and Christian temperance. Calvin Hoole rarely left the state of Missouri. He often walked barefoot, and his feet were said to be so calloused that his soles were as thick as boot leather. He saved his shoes for meetings with his clients, where he tried his best to cover his backwoods manners with a veneer of society polish. George Caleb Bingham was said to be a close friend of his, and Hoole clearly benefited from this association. Bingham's artistic education was much broader, and included years spent in European ateliers. Hoole's compositions owe a debt to Bingham, and to the etchings and drawings that he saw in his mentor's collection. Brushes of Calvin Lemuel Hoole, 1850s, 8 1/2 and 9 1/2 inches. Calvin Lemuel Hoole, "Major Samuel Lane at South River, Maryland, 1680", 1857, oil on canvas, 19 1/4 x 16 1/2 inches. Samuel Lane (1628-1681) was the founder in America of Dr. Patton's mother's line. Appointed a Major in the local militia, Lane was depicted by Hoole in a skirmish against the Seneca. Hoole then chose to depict an incident in the life of Samuel's son, Dutton Lane (1671-1726), the Deputy Surveyor of Baltimore County. While surveying the property of John Howard, the members of his party were shocked when Howard killed a rattlesnake, cut out its heart, and ate it. Hoole skillfully captures the wide variety of expressions on his subjects' faces, and fills the painting with the early morning light of this newly settled territory. 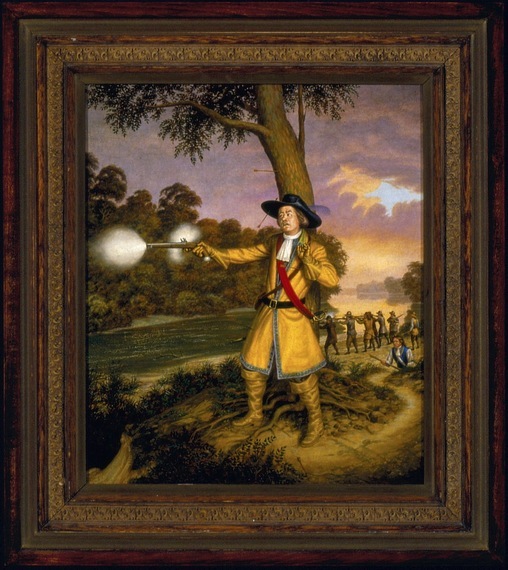 Calvin Lemuel Hoole, "Deputy Surveyor Dutton Lane at John Howard's Stake, Baltimore County, 1700," 1858, oil on canvas, 14 x 20 inches. 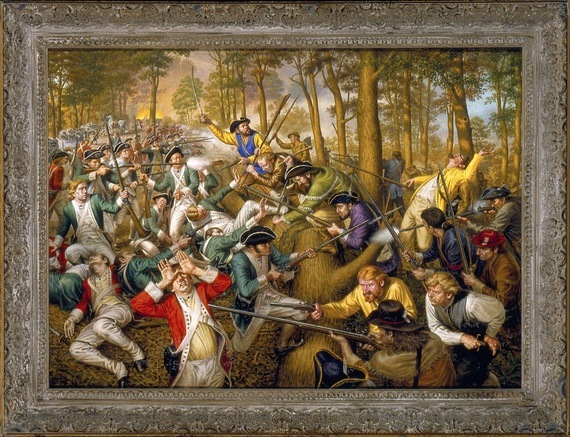 Calvin Lemuel Hoole, "The Battle of Kings Mountain: Colonel Andrew Hampton on the Heights", 1858, oil on canvas, 28 x 38 1/2 inches. Calvin Hoole excelled at the depiction of groups of people in action. His figures move naturally, devoid of the stiffness of many self-taught painters. His "Battle of Kings Mountain" writhes with the violence of war, with the thrust of the American patriots and the wavering of the British lines carried in the underlying abstract composition. The crowd in "Tidence Lane Preaching" is imbued with an electric charge, their religious fervor expressed in the shifting colors and varied gestures of the faithful. Of particular interest is Hoole's sympathetic depiction of African slaves, an empathy borne of a life of hard work and few comforts, and a pacifist, tolerant view of human kind. 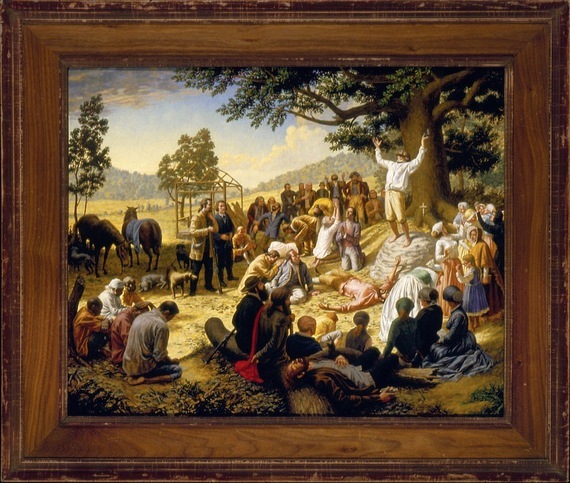 Calvin Lemuel Hoole, "Tidence Lane Preaching at Buffalo Ridge, Tennessee, in 1780", 1859, oil on panel, 24 x 30 inches. 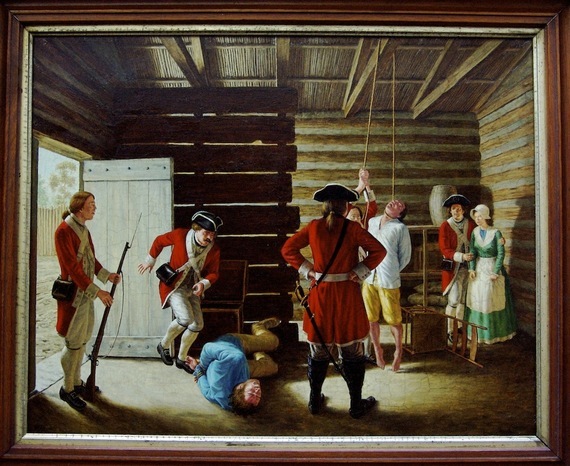 Calvin Lemuel Hoole, "The Thomas Brothers Tortured by the English in 1781", 1857, oil on panel. 19 x 24 inches. Dr. Alfred Lane Patton and his wife Priscilla Thomas also commissioned Hoole to paint the Revolutionary War story of Samuel Thomas and his brother in the infamous Fort 96. In the stockade they were starved and beaten, and, with their mother present, hung by their necks in an attempt to coerce them into confessing the whereabouts of their rebel father. All the while the stalwart pioneer woman looked on, encouraging her sons, "Don't you weaken, Boys!" Calvin Lemuel Hoole, "Daniel Thomas Pioneers Hinds County, Mississippi, in 1830", 1859, oil on canvas, 20 x 16 inches. 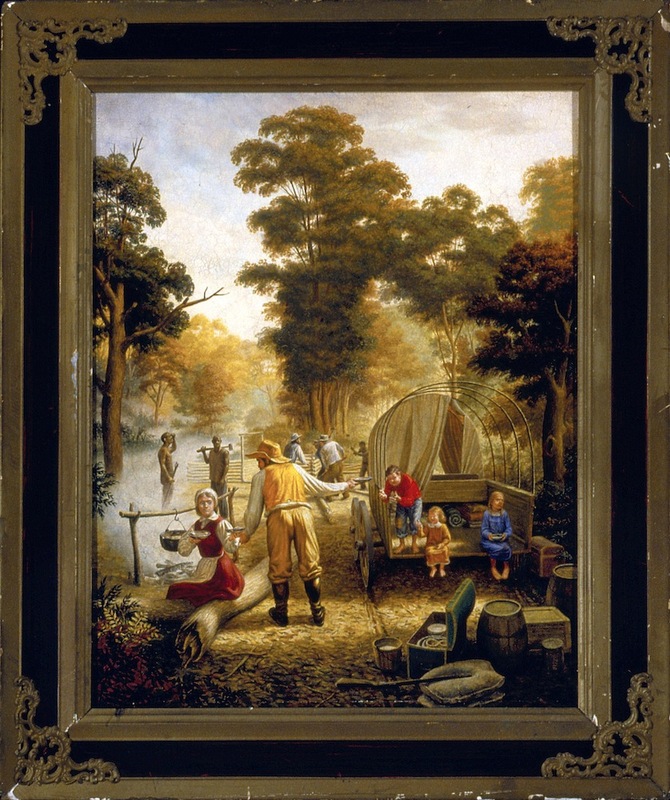 Daniel Thomas and his wife are depicted homesteading with their children, including Priscilla, who will grow up to be Calvin Hoole's main patron. Other men are engaged in the construction of a log hut, the autumnal trees towering above them. Hoole captures a peaceful moment in the family's difficult move from Louisiana to Mississippi, artfully employing tonal shifts to impart a sense of the awesome Southern landscape and the isolation of these early settlers. The serene atmosphere of "Swallow Bluff" depicts the arrival of newlyweds Richard T. Patton (1794-1860) and Anna Lane to their Tennessee homestead at Swallow Bluff on the Tennessee River. 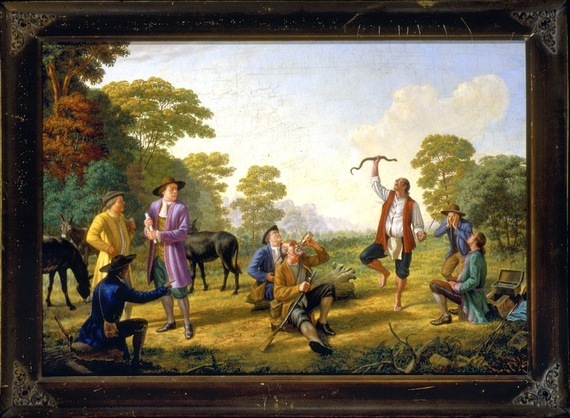 Calvin Hoole's indebtedness to George Caleb Bingham is made clear in this work. The Bingham paintings of Missouri river men, such as "Fur Traders on the Missouri," 1845, are imbued with the same light and sense of calm. Unlike his friend Bingham, Hoole hated river travel, and had an intense fear of drowning. The 'Foot-sore Painter' always preferred his feet planted firmly on solid ground. 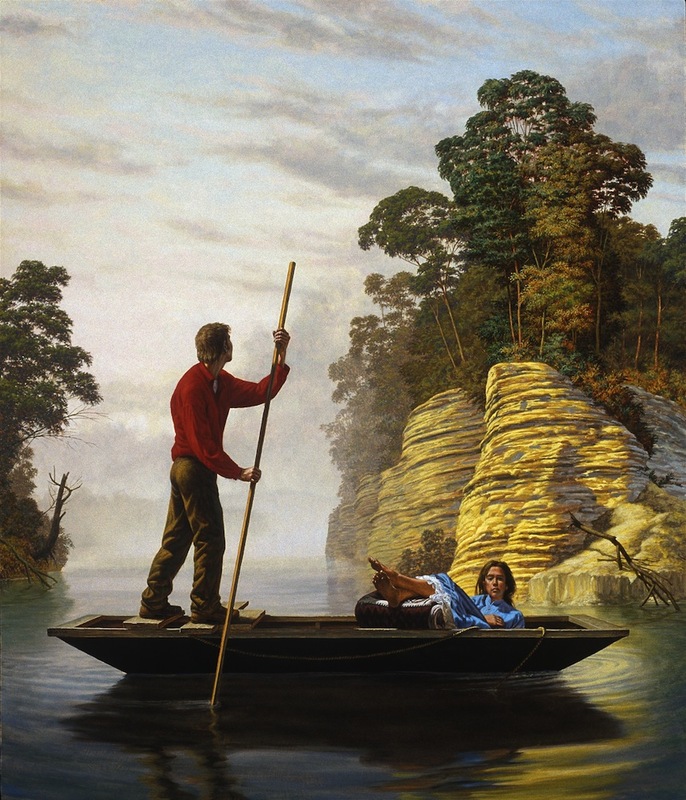 These works, and many others, are presented in The Paternal Suit: Heirlooms from the F. Scott Hess Family Foundation, on view at the Long Beach Museum of Art from July 10 through October 5, 2014. The exhibition first toured the South, originating at the Halsey Institute of Contemporary Art in Charleston, SC.